I think it's fair to say I'm late on the bandwagon with this one. 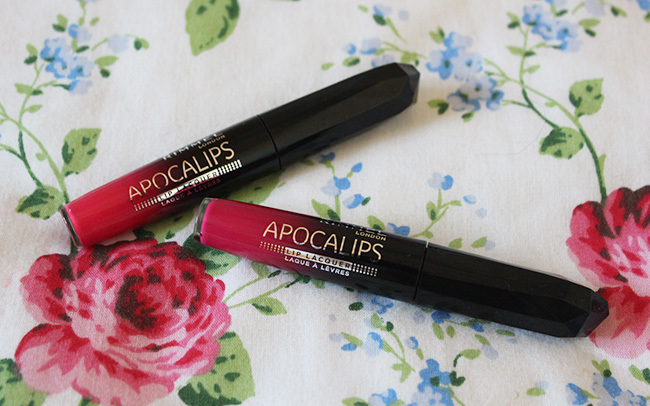 The Rimmel Apocalips were released around 18 months ago and although I've been interested to try them, I've just always passed. I've never been a big fan of glossy lips and I'd read reviews that said they can smudge easily which always put me off. Although Rimmel are pretty much my go-to for drugstore lips so I don't really know why I didn't just trust them to create something amazing. However on a recent trip to Poundland I noticed they were selling three different shades and at £1 each I couldn't resist finally trying them and picked up these two shades. 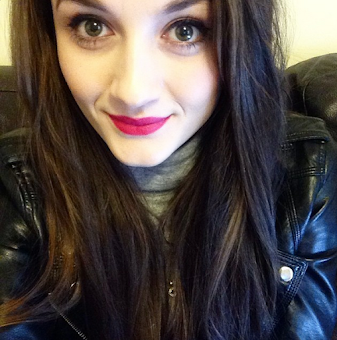 The first shade I decided upon was Apocaliptic, which is a deep berry pink colour, so one perfect for the Autumn and Winter months. A typical 'me' shade, and one I think I'll be getting a lot of use out of in the next few months. The second shade was Stellar, which is more of a coral toned pink, so defiantly more of a Summer shade. Coral toned colours aren't something which I tend to gravitate towards because I find they make my pale complexion even more washed out and have a tendency to make my teeth look slightly yellow, but I thought I'd give it a go anyway. The consistency is slightly thick but really creamy and becomes opaque from one layer of product. They first go on glossy but after a few hours eventually dry matte, however it's what I find to be a comfortable matte texture, it doesn't feel too drying and instead feels like there's nothing even on the lips - I was constantly checking it was still there because it felt like it had all gone. The wear time of them is amazing, even through eating a stain is still left on the lips and they don't even budge from drinking. For day to day wear my personal favourite way to wear them is to apply a small amount in the middle of both lips and blend it out with my finger, this method means they dry matte instantly and aren't too dramatic for the day. The applicator is also a great selling point, it is a doe foot applicator with a slight well in it that holds the perfect amount of product. The shape of it is slightly pointed meaning it fits perfectly to the shape of the lips and helps to get a precise and neat application. 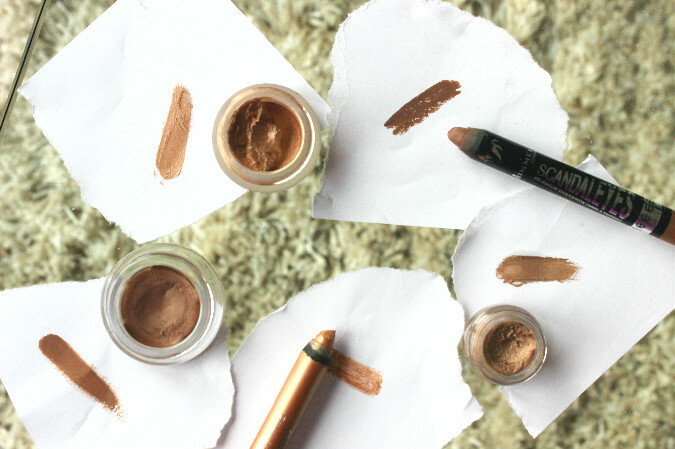 It is basically the perfect applicator for cream lip products! I'm almost regretting not picking these up earlier, because they're some of the best lips products I've tried in a long time! I'm now keen to compare these against Revlon's new gloss stain and see how the two compare. I'll be defiantly be looking to try more shades of the Apocalips in the future and seriously recommend everyone trying them. 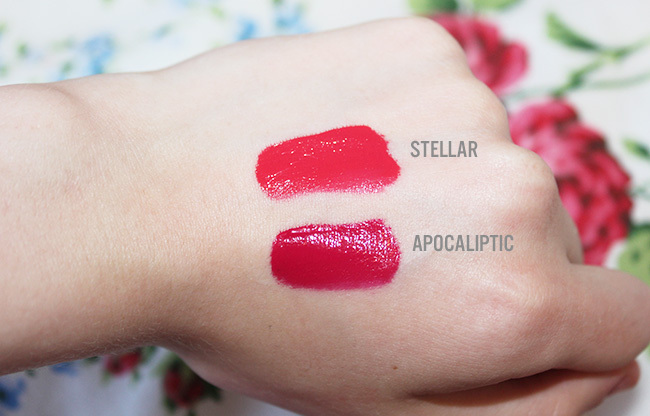 Of the two my favourite has to be Apocaliptic, I find it just suits me more and is one I feel I can get use out of all year round, however I do still love Stellar and found it to suit me a lot more than I thought it would. I'd also recommend checking out your nearest Poundland, I always see Revlon and Rimmel nail polishes and Rimmel eyeshadows in mine, so they're worth popping in to! I have these shades as well and I adore the product itself, but I have noticed some slight bleeding, even with a primer underneath -- but perhaps there's just something a little off in my application! 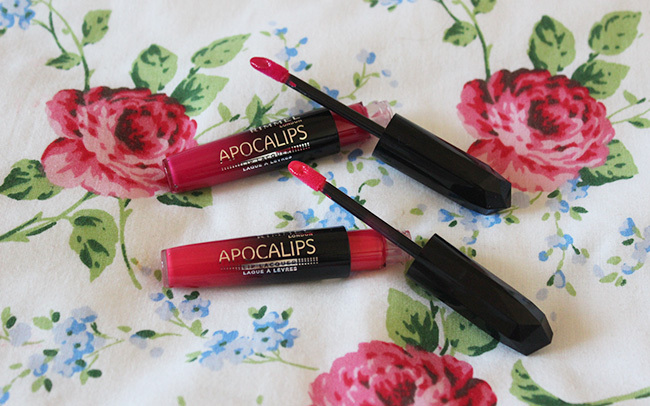 I love the Apocalips lip glosses! The colour is so vibrant and it definitely does stay on all day! I have the colour Apocaliptic too and I love it! I love these lip glosses! Im in love with the Stellar shade! its gorgeous! !